You take the wheel of one of the world’s most popular sports cars and drive yourself around the bends of Bruce McLaren Motorsport Park’s international motor racing circuit. Your pro-driver instructor will show you how to tackle Bruce McLaren Motorsport Park’s sweeping bends and thrilling straights then you’re let loose to enjoy the feeling of piloting your own fun sports car at whatever pace you’re comfortable with. Whatever your requirements, whether you’re on your own or in a group, we will work with you to create a fun and memorable driving experience for you and your guests. Drivers Briefing followed by a Instructor lap. Then 5 laps of the Bruce McLaren Motorsport Park motor racing circuit in our track prepared MX-5 sports car. Your choice of manual or automatic. Tuition by sports car driving instructor. Race suit and helmet provided. Then 10 laps of the Bruce McLaren Motorsport Park motor racing circuit in our track prepared MX-5 sports car. Bonus includes 2 HOT LAPS with instructor. Contact us in advance to make your reservation. Fun Drive operates daily, however as you will be driving on a professional motor racing circuit, we need to work in with other race track bookings. 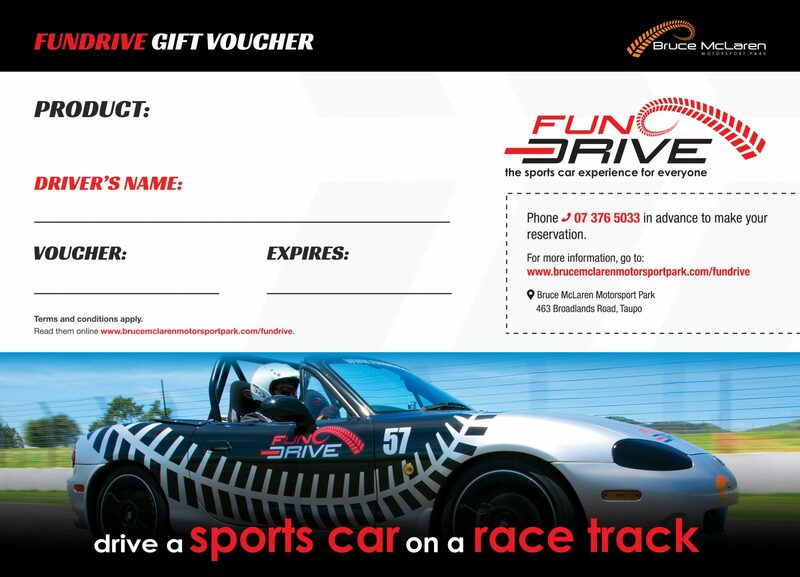 To participate in Fun Drive, you need a valid driver’s licence. Please complete the following fields and submit your booking request to us. We will respond to confirm your booking, at which time we will require a deposit. Vouchers are non-refundable but they are transferable. Fun Drive has a zero alcohol tolerance.